Mastering the language. In the on-site class each week, students master all the most important principles of the English language — including grammar, usage, punctuation, and more. Becoming a strong reader. 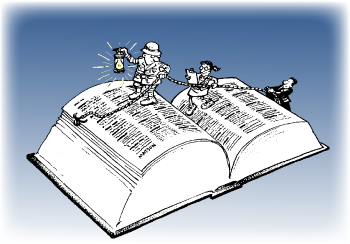 In the online class, they are introduced to close reading of great literature and all the attendant skills. They also read essays of literary analysis that are models of the form. This course serves as a precursor to our course Logical Communication. employ with dictionary-precision a rich arsenal of English words. 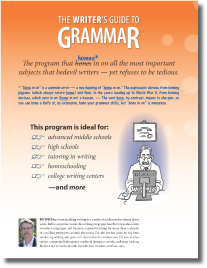 Students in Foundations of Writing undergo a kind of boot-camp in English grammar, usage, and punctuation — intensive training that relies on our own proprietary methods and materials. 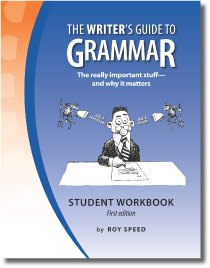 Each student receives our workbook The Writer's Guide to Grammar, shown at right. It includes exercises like our vocabulary series Workout With Words. For the on-site classes in grammar, usage, punctuation, and vocabulary, the instructor provides our workbook and other proprietary materials. Romeo & Juliet, by William Shakespeare. Macbeth — an astonishingly condensed play from Shakespeare's mature period, in which he examines human conscience from a remarkably modern perspective. In this intensive study of Shakespeare, students experience real insight — into the psychology of characters, into human nature, into life itself — and experience for themselves what great writing can achieve. In the process, they learn important study skills, like close reading and annotation. Equally important, they learn to get beyond the literal meanings of words to the vast landscapes of meaning behind the words. They read essays representing the finest in literary analysis and see for themselves what it looks like to deliver great insights and support them with specific evidence. Writing is one of the most difficult subjects to teach — partly because it is not a single complex skill, but rather a host of different skills, all intertwined. It is also a process — and like all complex processes, it is susceptible to ineffective and inefficient approaches. a sound process — an approach that not only includes all the critical steps, but presents them in the most efficient and effective sequence, e.g., getting your thoughts clear before you try to write sentences and paragraphs. To write in a particular form — like the essay — they must first understand and appreciate that form, i.e., they must explore models of that form. Students must learn to appreciate the craft of writing, with real insight into what gives a sentence real impact, what makes a train of thought easy to follow, what makes an argument compelling. They must be equipped with a rich arsenal of tools not only for writing, but for thinking, for working with thoughts and ideas. For all these reasons, we teach writing in stages, with the first stage being Foundations of Writing in the Green Blend — a course in which our students become adept at working with language, including everything from punctuation to vocabulary and basic reasoning. In the Blue Blend they take Logical Communication, in which they explore working with ideas and logical flow. Finally, in the Gold Blend's Essay Writing & Appreciation, our students read and come to appreciate great essays and begin to write essays themselves. We felt relief at having found [The Blend] and had high hopes from the beginning. Everything we wished for our daughter has come true. Your insight is amazing. The respect with which you treat the students is admirable, as is your ability to challenge them and interest them in what you teach. We are also happy with the peer influences exerted. I would recommend The Blend to anyone searching for an excellent education in an excellent environment. We look forward to another year.